On June 19th, the R/V Roger Revelle departed Newport, OR to begin VISIONS’18, a 47-day expedition to replace and maintain elements of the Cabled Array off the coasts of Oregon and Washington as well as to add some novel sensors. 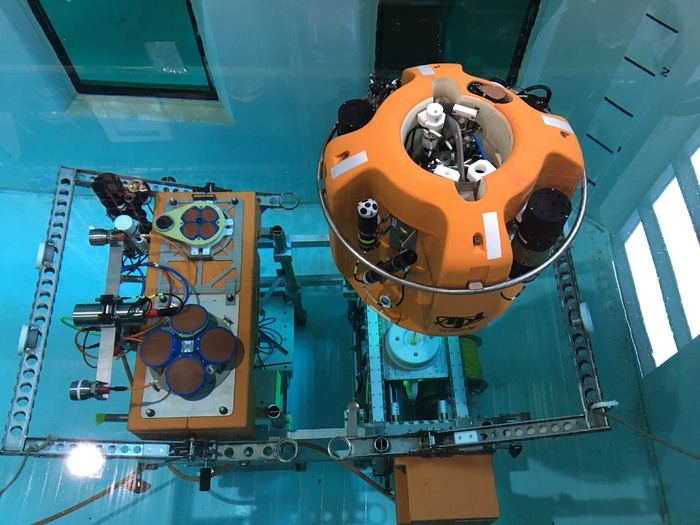 Led by Chief Scientist Deb Kelley, this is the fourth Operations and Maintenance cruise for the Cabled Array implementing organization, as part of the National Science Foundation’s (NSF) Ocean Observatories Initiative. The cruise will use the remotely operated vehicle (ROV) Jason from Woods Hole Oceanographic Institution onboard the Revelle operated by Scripps Institution of Oceanography. Over 20 US and international undergraduate and graduate students will join us on this expedition, working side-by-side scientists, engineers, and the ship and ROV teams. The multi-leg cruise will run from June 19 to August 5, 2018. You can learn more about the cruise on the VISIONS’18 website, which includes daily cruise logs, as well as image and video galleries. Make sure to check out the Live Video Feed! You can also follow along on Twitter (@VISIONSops), where up-to-the-minute updates about activities on board are posted.